Well, we could digress for quite some time about the band’s talent musically and lyrically, as well as their masterful blending of musical genres (country, rock and blues). Or we could talk about how I still regret not going to see them in Saskatoon a few years back. Instead, I’ll relate a bit of an anecdote that has to do with their music and my writing. 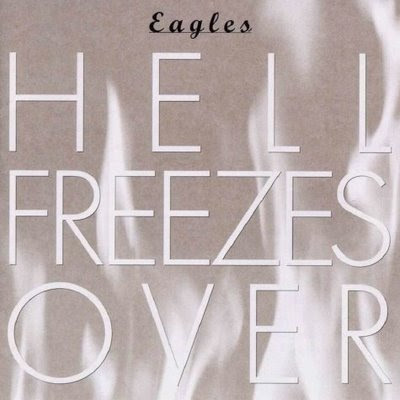 The Hell Freezes Over album (and their reunion tour) happened around ’94, when I was about ten years old. My parents promptly bought the album, and I promptly borrowed it for months at a time. It featured the most incredible acoustic version of Hotel California, four new tracks, and really great concert recordings of many of their greatest hits. At the time, I was obsessed with a series of characters in my head who mainly ran around doing G.I. Joe-esque ‘missions’…that is to say, blowing up enemy bases and generally engaging in gratuitous violence for the sake of world peace. It was the world as I understood it in my pre-teen years. I wanted to write novels upon novels (I think I had up to twenty of these planned at some point) featuring these characters, eventually including an afterlife of Roman-Catholic proportions, battles between heaven and hell, and so on. Now, The Eagles’ lyrics generally speak to an adult crowd, dealing with subject matter that most people won’t relate to until they’ve had similar experiences, or at least can make certain inferences, sometime in their late teens or early twenties, say. We’re talking about complicated relationships, Life in the Fast Lane, and the decadence of Western society. Yet, by listening to this album ad nauseum and thinking about my characters through the lens of some of the lyrics, I came to a greater understanding of both the lyrics and these imaginary people. Suddenly Desperado was a scene where a character makes a desperate plea to his greatest adversary, begging him to change his ways and accept forgiveness rather than resort to violence. Hotel California became a dream sequence, warning the main character that his life of debauchery would eventually destroy him. You never know when or how a piece of music will provide inspiration, and often the unexpected will yield surprisingly useful results. The Eagles still inspire me, and that’s one thing I don’t expect to change. I don’t write about angels and demons anymore, but I learned a lot about my craft when I did, and I often have great musicians to thank for pushing me in a positive direction.